SCVHistory.com | Hart on Stage | View of Cash Hawkins (William S. Hart) Death Scene in 'The Squaw Man,' 1907. Addressed but unfranked penny postcard, 3.5x5 inches, showing a scene from Act II of the Liebler & Co. production of "The Squaw Man," 1907. Photo by Hall's Studio of New York (uncredited on postcard). At left, the evil squaw man Cash Hawkins (William S. Hart) is sprawled on the floor, dead. Note that there's a gun in each hand of "Two-Gun Bill." At right, Nat-U-Ritch (Evelyn Wright), the Ute chief's daughter whom Hawkins had kept against her wishes, confesses the murder to a different kind of a squaw man — her lover and rescuer James Winnegate (William Faversham). The same image appears opposite page 182 in the 1906 Harper & Brothers illustrated edition of the novel, "The Squaw Man," by Edwin Milton Royle and Julie Opp Faversham, "founded on the play of that name by Edwin Milton Royle." The 1906 edition is dedicated to William Faversham and states: "The illustrations in this book are reproduced from photographs of scenes in the play, made by Hall's Studio, New York." 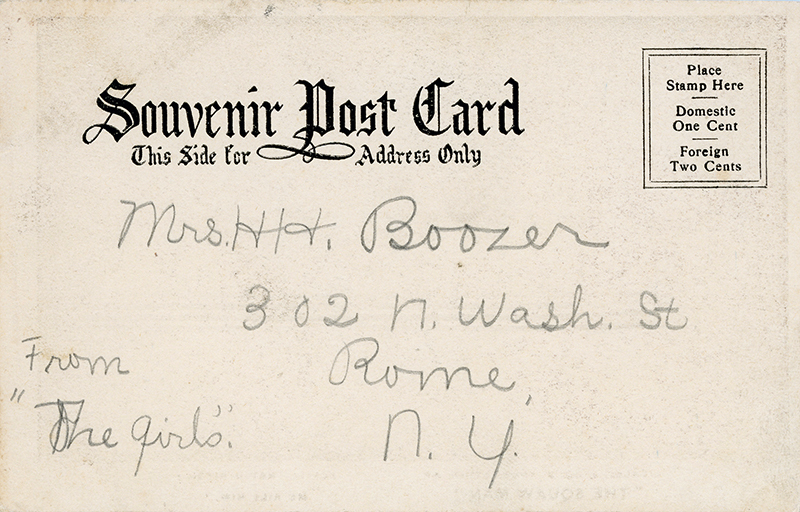 This particular "souvenir post card" is hand-addressed to Mrs. H.H. Boozer / 302 N. Wash. St. / Rome, N.Y. / from "The Girls." Hart appeared in "The Squaw Man" throughout its initial run from October 1905 to May 1907, but we know this postcard was sold (or at least addressed) near the end of the production run in the spring of 1907 — or possibly later — because the following item appears in the April 11, 1907, edition of The Waterloo (Ind.) Press newspaper: "Mrs. H.H. Boozer expects to leave with her daughters Saturday evening, for Rome, N.Y., where they will make their future home." Forty-year-old William S. Hart was supplementing his meager acting income by working for a detective agency in New York when he landed a small role in George C. Tyler's 1905 production of Edwin Milton Royle's new melodrama, "The Squaw Man." 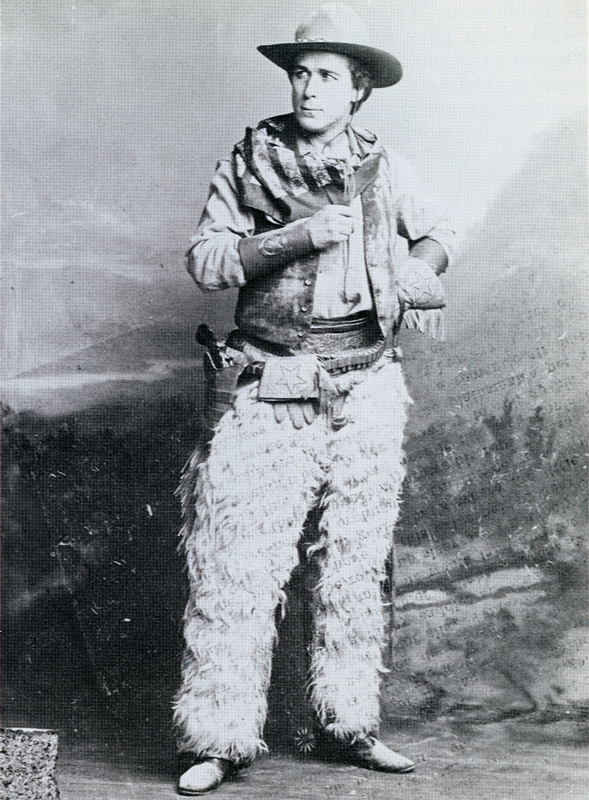 Hart portrayed the cattle rustler Cash Hawkins — a "mean skunk," in Hart's words, who had taken Nat-U-Ritch (Evelyn Wright), the daughter of a Ute chief, as a bride. (A "squaw man" was typically a white settler in the American West who lived with a native woman, often obtained through kidnap or purchase.) In the story, the protagonist James Winnegate (William Faversham) is wrongly accused of embezzling from an orphan fund and flees to Wyoming where he encounters Hawkins and frees Nat-U-Ritch from his grasp. Hawkins plots his revenge but is shot dead by Nat-U-Ritch. Winnegate is later injured in an accident and is nursed back to health by Nat-U-Ritch, who falls in love with him and bears him a child. Winnegate is ultimately cleared of wrongdoing, but not before the sheriff (William Frederick) discovers the weapon used to kill Hawkins, and Nat-U-Ritch, fearing incarceration and separation from her child, commits suicide. Hart as Cash Hawkins ~1905. Click to enlarge. "The chaps they had furnished for us all to wear were made out of old rugs and doormats that had been lying around the storehouse," Hart writes. "The legs were fur all the way round like an Eskimo's pants." Tyler authorized Hart to "order chaps, quirts, spurs, etc., which I did by wire, from Pueblo, Colo."
"I recall one English actor saying to me: 'I say, old chap, you seem to be a bit of an authority on these uniforms. Why is it some of us wear white fur pants? Is it because we belong to the same regiment?'" When the play opened at Wallack's Theater in Manhattan on Oct. 23, 1905, "Cash Hawkins was the first presentation of a real American cowboy that Broadway had ever seen," Hart boasts, with some justification. Buffalo Bill Cody attended the opening-night performance and was duly impressed; the lawman-turned-sportswriter W.B. "Bat" Masterson later wrote to Hart: "Your portrayal of Cash Hawkins, the cowboy desperado, is exceptionally good, giving as you do to the part the proper atmosphere in every detail" (Davis 2003:48). 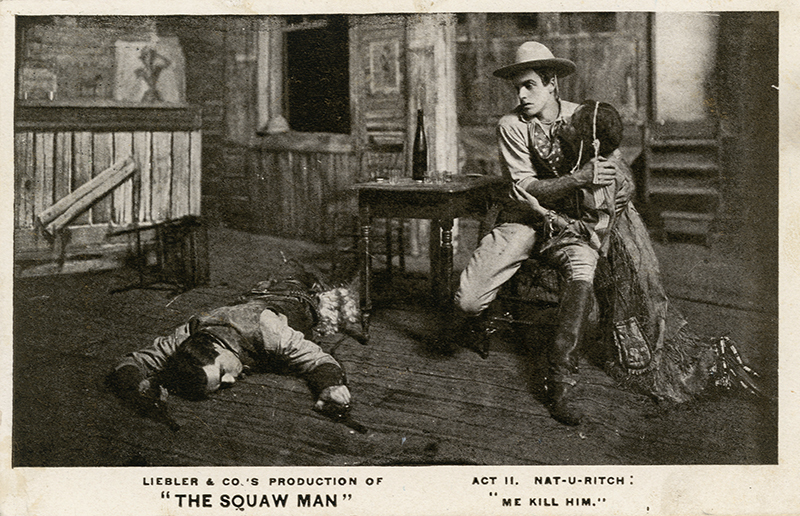 The Liebler & Co. production of "The Squaw Man" played through May 1907 in New York and on the road, and "for the first time in his life Hart had a few hundred dollars in the bank" (ibid:49). He put $800 down on an $1,800 house in Westport, Conn., for himself, his sister Mary Ellen and their ailing mother. The following season he landed the title role in Owen Wister's "The Virginian" at a salary of $125 per week. Meanwhile, "The Squaw Man" played in London, and in 1914 Cecil B. DeMille made a film version with Dustin Farnham in the lead role. Farnham was a major star when he made the transition from Broadway to Hollywood in 1910. Hart was a fairly late arrival when he came out in 1914. But Hart would soon eclipse Farnham in popularity — although he never did appear in any film version of "The Squaw Man." LW2841: 9600 dpi jpegs from original postcard purchased 2016 by Leon Worden.